With Nicolas Otamendi missing the Leicester match due to suspension, let’s take a look at the candidates to replace him and partner up with John Stones. Stones has already labelled Otamendi’s absence as a “big loss” and Pep Guardiola will be keen to find the right replacement so that his loss isn’t as damaging as it potentially could be. The Argentinian has struck up a fantastic partnership with his Yorkshire-born counterpart and has become an integral part of the team, even proving to be somewhat of a goal threat. Otamendi has also noticeably made great strides in improving his decision making and positioning this season, and as such has cut out the rashness that used to mar his game. The popular option would be to give local-born academy product Tosin Adarabioyo a run out against Leicester. Tosin has shown great promise throughout his youth career at City, even captaining the under-18 team at the age of 16. 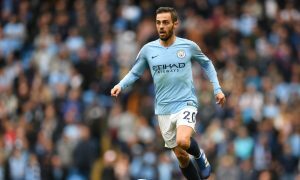 He clearly has a maturity and confidence that belies his youthfulness, and he has been on the fringes of the City team since Guardiola joined. Pep gave Adarabioyo a chance in pre-season as he came on as substitute in the Real Madrid, Tottenham and West Ham games, whilst starting the match against Girona. He also started in the League Cup win against Wolves, and gave a composed display, especially as the Championship leaders racked up the pressure late on. Indeed Adarabioyo had to do the work of two men that night as his more experienced defensive partner Eliaquim Mangala went walkabout. It could be hoped that Pep made a note of who was the more impressive of the 2 centre backs that night and this could be Tosin’s main argument for starting against Leicester. Stones offers City a calming influence at the back and Tosin is certainly of the same mould, a partnership between the two would definitely still be in keeping with Pep’s insistence on passing out from the back, as the youngster is comfortable on the ball. Mangala is clearly likeable and is trying hard to prolong his City career, but he looks a shell of the man whose impressive debut against Chelsea and the nullifying of Diego Costa had City fans wondering whether we had stumbled across Vincent Kompany version 2.0. Pep may side with Mangala due to his experience, and this is something that he holds over Tosin. Mangala has featured regularly for some of Europe’s top teams, and was a shining light of an impressive Porto side. This form earnt him his big move to City, but the Frenchman has simply failed to live up to his price tag and expectations. Mangala is a more physical presence than Tosin, which Pep may look to in terms of trying to match the dynamic that Stones and Otamendi have created. The Frenchman could do the dirty work and allow Stones to continue to excel at the technical side of defending. But football has moved on from defenders like Mangala and managers such as Pep look for defenders who are multi-faceted rather than just big physical lads. If Eliaquim could just stick to the basics then the Stones partnership makes sense, yet there is always the feeling, even on his best days, that a big mistake is just round the corner. As stated there is the suspicion that Mangala’s experience edges him in front of Tosin, and a Premier League start against a pacey and lively forward line-up that may feature Jamie Vardy, Shinji Okazaki and Riyad Mahrez would be a baptism of fire for Tosin. Mangala has faced these kinds of attackers throughout his career, but in a City shirt has looked susceptible to anyone willing to put him under pressure. Pep may opt to give Danilo a run out a centre-back. Danilo is probably a victim to his own versatility in that we’re still unsure where he will feature consistently for City. He was signed as right-back who could cover the defensive midfield area, but so far he has found Kyle Walker and Fernandinho in exceptional form. However he has looked impressive during his cameos this season and has certainly started his City career with promise. Danilo started the win against Liverpool as the right hand side of a back three featuring Stones and Otamendi. Mohamed Salah gave Otamendi kittens before the sending off whilst Danilo looked calm and composed. It is indeed his composure that could earn him the start against Leicester; he’s also comfortable with the ball in tight situations and would assist Stones in building out from the back. Whilst he has been used by Pep in defence, centre back is not his natural position, and Guardiola may look for someone with more familiarity in the position in what is an important game. If Vincent Kompany ever regains fitness then there is the chance he might feature against Leicester. City are clearly not rushing Kompany back, and Guardiola must still be smarting in regards to the injury he picked up on international duty, as the City captain had made a solid start to the season. Fernandinho has made the odd foray into defence when the Blues have needed him to, but he is in great form and close to indispensable in the holding midfield role, so barring any major shocks he will continue where he is most comfortable. If Pep is bold, and he has been bold in certain team selections so far this season, then he might see the merits of blooding a youngster in the form of Adarabioyo. Particularly with Stones playing so well, he could take Tosin under his wing and guide him through the game. Pep may opt for more experience though in a bid to keep this amazing run going, and if he does then Mangala or maybe Danilo might be the preferred option.